I can't believe that as from tomorrow we're already into the second month of the virtual cafe! March is full of celebration days, including St. David's Day (1st March), Shrove Tuesday (4th March), St. Patrick's Day (17th March), French Bread Day (20th March) and of Course Mothering Sunday (30th March). But did you know that "French Bread Day" is also the same day as Proposal Day and Kiss your Fiancee Day. So why not propose, kiss your fiancee and serve up French Bread Pizza for dinner? Mothering Sunday lunch is a three course lunch which is full of flavour, but not full of time! You will easily knock up all three courses in no time at all and some can be made ahead to save on time. The meal will spoil all mums out there, and whether you make it for yourself or someone else makes it for you, I hope you all have a fantastic day. Tomorrow will see the first of March's Menu recipes; Welsh Rarebit with a Leek & Thyme Garnish to celebrate St. David's Day. Welsh rarebit, I believe was first introduced in the 18th Century and is also known as Welsh Rabbit. My vegan version of this classic dish is garnished with leeks to give it that extra Welsh touch. 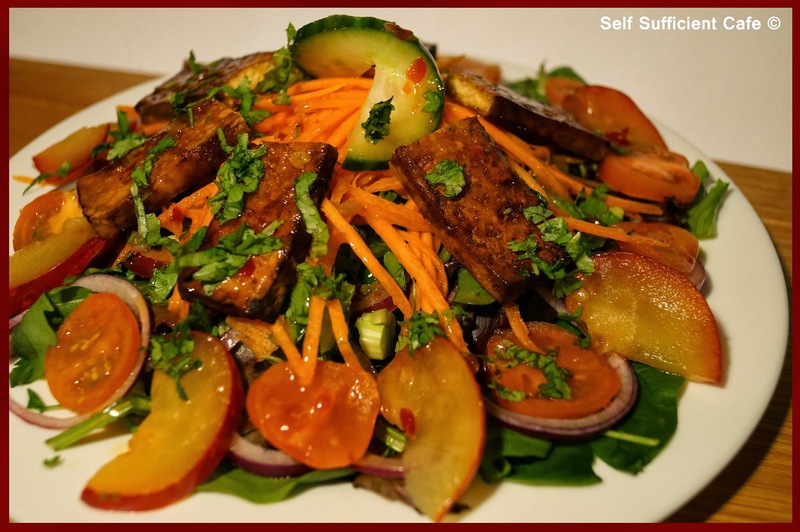 Here is the last recipe from the February Menu I posted at the beginning of the month, Asian Fusion Salad. I don't normally like fruit in savoury dishes, pineapple on a pizza is a no no, but I need to push my taste boundaries and so I included a fruit in this dish. I was absolutely amazed with the results, I ended up making more dressing just so I could dip more plums into it! Now that is progress! First, drain the tofu and press for at least half an hour to remove the excess moisture. Once the tofu has been pressed slice into 6 slices. Pour the marinade ingredients into an oven proof dish and mix to combine. Add the tofu and turn so that both sides are coated with the marinade. Bake in a moderate oven for 15-20 minutes, turning once. 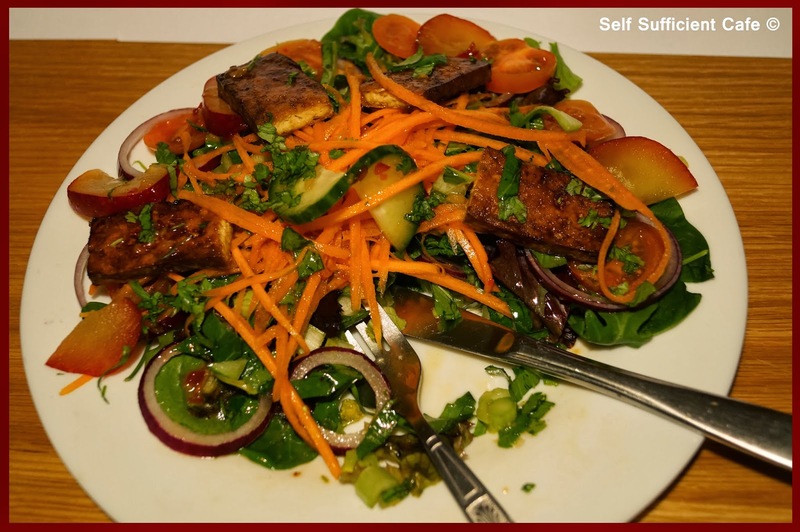 Arrange the salad leaves on two plates and top with the red onion and choi sum. Add the tomatoes, carrots and plums and sprinkle with the coriander. 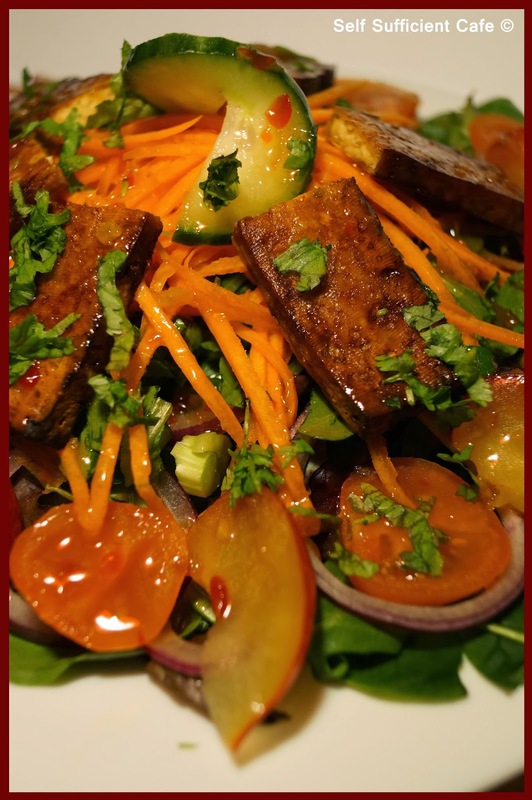 Once the tofu has cooked, cut each slice in half and arrange on top of the salad. Garnish the salad with a twist of cucumber if you wish and pour over the dressing. The menu for March will be posted soon, and there is so much to celebrate in March! Yep, it's another recipe from the specials board and this time it's a twist on cauliflower cheese. 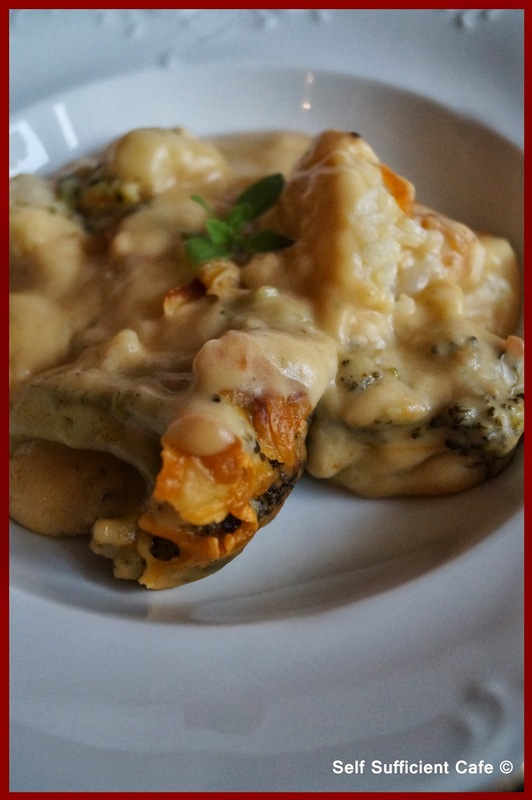 I don't know about you but the few pub chains near where I live always seem to have a cauliflower & broccoli bake on the menu, which for obvious reasons isn't suitable for vegans. So I thought let's make one and see what all the fuss is about. Boil or steam the cauliflower and broccoli so it still has and set aside to drain. Pour the almond milk into a saucepan and add the flour and vitalite and whisk continuously over a low heat until the mixture starts to simmer and thickens. Add the soft vegan cheese and stir to melt, turn off the heat. Add all but a tablespoon full of the vegan hard cheese and stir to melt, the mixture will be quite thick. 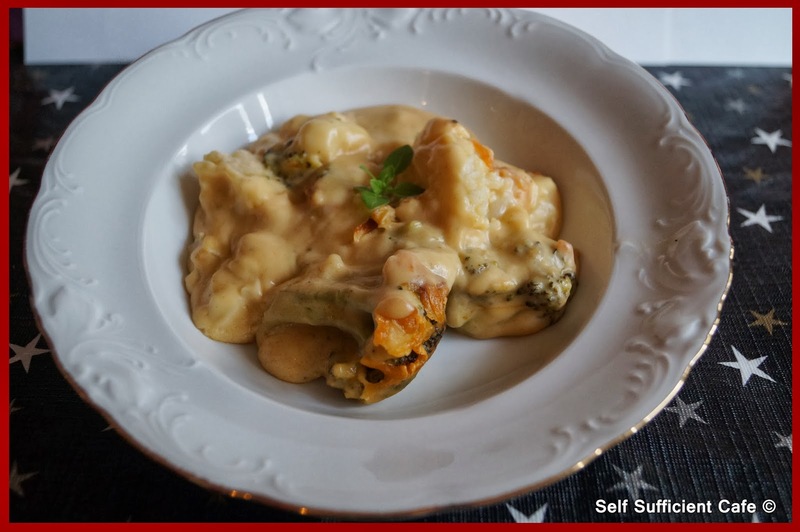 Tip the drained cauliflower and broccoli into an oven proof dish and pour over the cheese sauce. 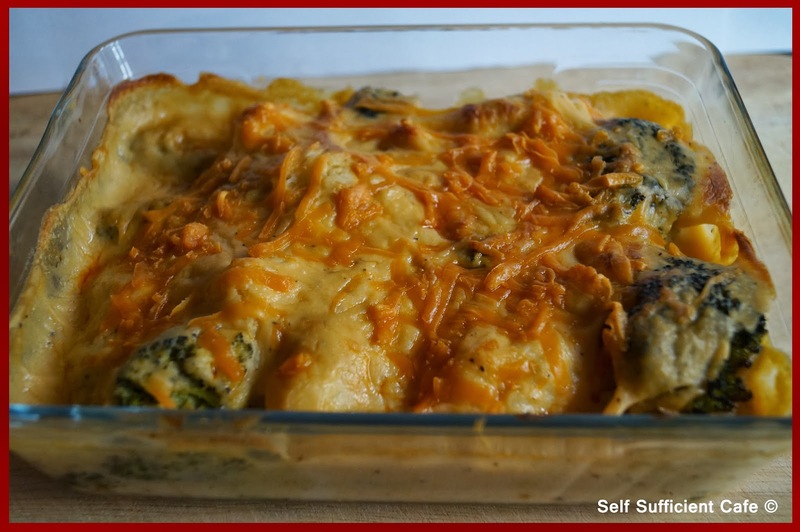 Sprinkle over the remaining hard cheese and bake in a moderate oven for 30 minutes. 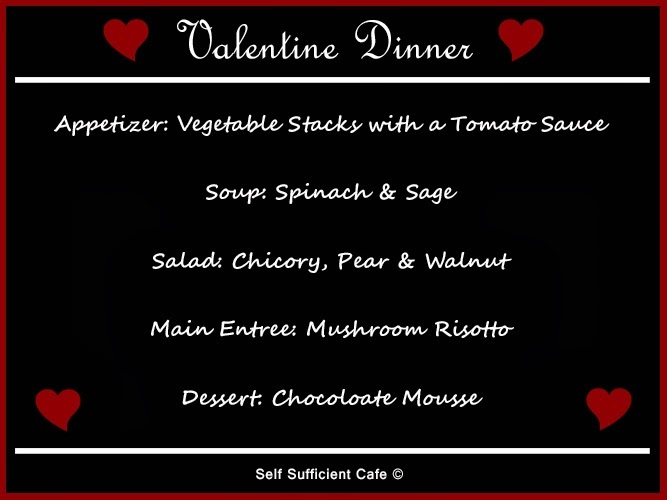 Last week I made some tomato sauce to serve with the vegetable stacks appetizer for our Valentines Dinner and I had some left over. 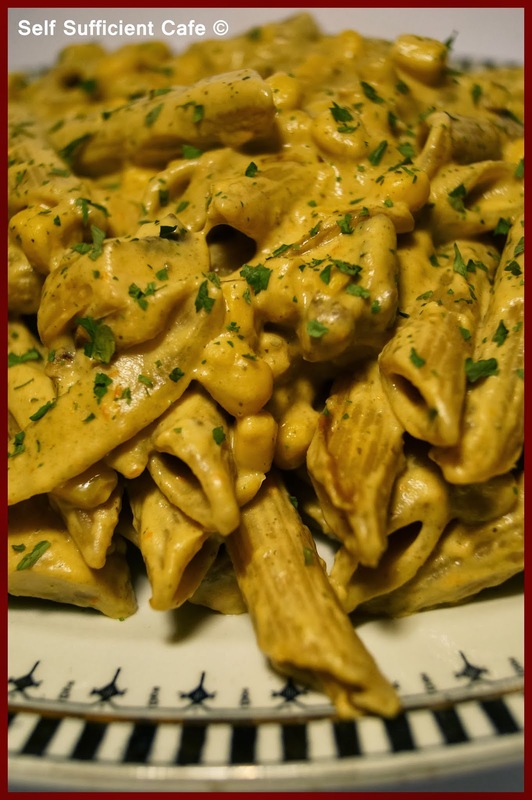 As you know, I'm not one to waste anything so I tweaked the sauce and used it to top some penne pasta. If you missed how to make the sauce you can find that here. I had about half the sauce left over and here is what I did. Combine the tomato sauce and milk in a saucepan and gently re-heat. If the sauce is still a little thick you can thin it with some pasta water later. Drain the sweetcorn and add to the pan along with the nutritional yeast, stir to combine. Add the paprika, parsley and salt and pepper to taste. Drain the pasta reserving a little of the pasta water and tip the pasta into the sauce. Stir to coat all the pasta and add a little of the reserved pasta water if the sauce is too thick. 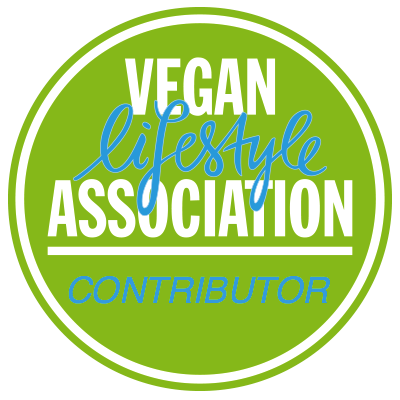 Have you heard about The Vegan Kind (TVK) Box? 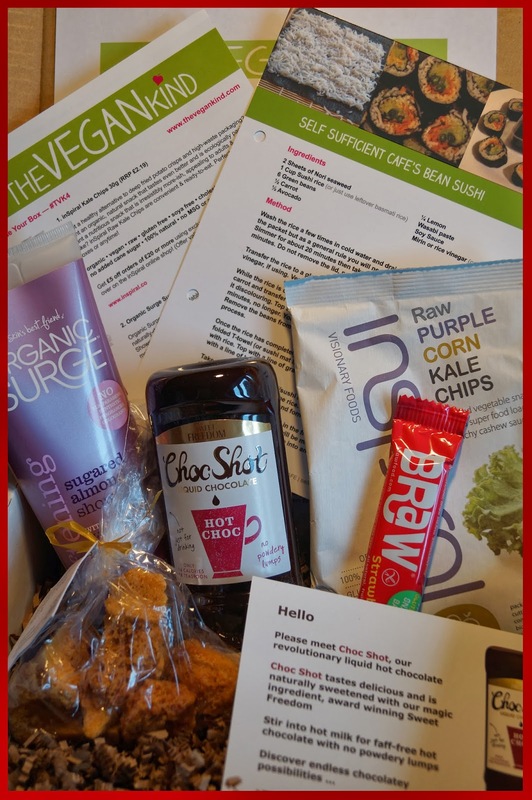 It's an awesome monthly subscription box scheme full of lovely vegan goodies posted to your door. It takes the hassle out of checking the ingredient list to see if the item is suitable for vegans before you buy. If like me you've sat at your computer for hours on end researching what is vegan and what isn't this is the scheme for you! Besides its like having a birthday every month as you never know what will be in that box of goodies! Your box of goodies can contain items including (but not exclusive to) food, toiletries, cleaning products, household supplies and accessories. You will also receive a recipe card every month and in month 3 of your subscription you will also receive a free TVK ringbinder, which will keep all those recipe cards safe. It's not too late to subscribe, TVK is new scheme and their first box was shipped out in November 2013. Unfortunately this box has now sold out, as too has the December 2013, they're popular! The box costs £10 a month plus £2.95 postage and packing and it is so easy to sign up to. If you fancy receiving a box full of goodies once a month then you can sign up on their website. February's TVK box included: Organic Surge sugared almond shower gel, Inspiral Raw Kale Chips, Sweet Freedom Choc Shot, a packet of Cinder Toffee from the 1066 Cake Stand and a Braw Fruit Bar. To top it off it also included one of my vegan recipes, yay! My Bean Sushi Recipe was the chosen recipe for the recipe card, which you can also find on my blog, here. I absolutely loved the smell of the Organic Surge sugared almond shower gel, it was almost good enough to eat. Not only is this product vegan but it is free of all nasties including SLS, Parabens, Synthetic Fragrances and Colourants. I have tried the Sweet Freedom Choc Shot before as someone sent me one to try, but I haven't been able to get hold of one since so I was delighted to see it was included in the box. For those of you who haven't seen it before it is liquid chocolate, which is 100% natural. I must admit I have been known to eat this by a cheeky spoonful, but not to worry as it is only 14 calories a teaspoon! There are no artificial colourings, flavourings or preservatives, it is GM, dairy and gluten free, suitable for vegetarians & vegans and to top it off it's made in the UK! 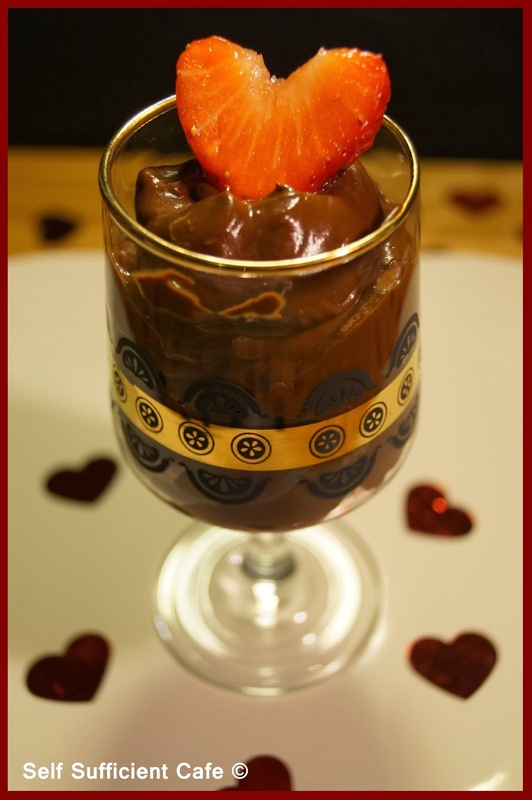 I used some of mine this time to make my chocolate mousse recipe for my Valentines Dinner, and in my opinion the secret to a good vegan chocolate avocado mousse is sweet freedom choc shot! My box included a strawberry Braw bar, which is one of four flavours and it was delicious, it was great as a mid morning snack at work. Other flavours are cocoa & orange, apple & pear and blackcurrent. These bars are 100% natural and do not include any added sugars, in fact Braw advise that any sugars present in the bar are purely from the fruit themselves. The bars are also gluten free as they use gluten free oats. The cinder toffee from 1066 Cake stand, took me back to the days of eating crunchies, and if you combined this with the choc shot you would have a vegan crunchie! Unfortunately my cellophane packet had ripped open and so some of the cinder toffee had gone a little soft, but that did not stop me eating it! And it didn't last long I'm ashamed to say. Another good use would be to serve it crumbled on top of choc shot on top of vegan ice cream, now I'm getting hungry. The final item in this months box was a packet of Inspiral kale chips, my packet was raw purple corn flavour, however this is one of 5 flavours Inspiral make. The other flavours are baobab & onion, beetroot & acerola, cacao & cinnamon and wasabi wheatgrass. The raw purple corn chips were absolutely delicious! I will definitely be buying these again, so moreish. The kale chips are organic, vegan, raw, gluten free and use no MSG or artificial additives. They would be great used as a crouton like topping for a salad that is, of course if you don't eat them all in one go when you open them! I can't believe we're in the third week of February already, time flies! 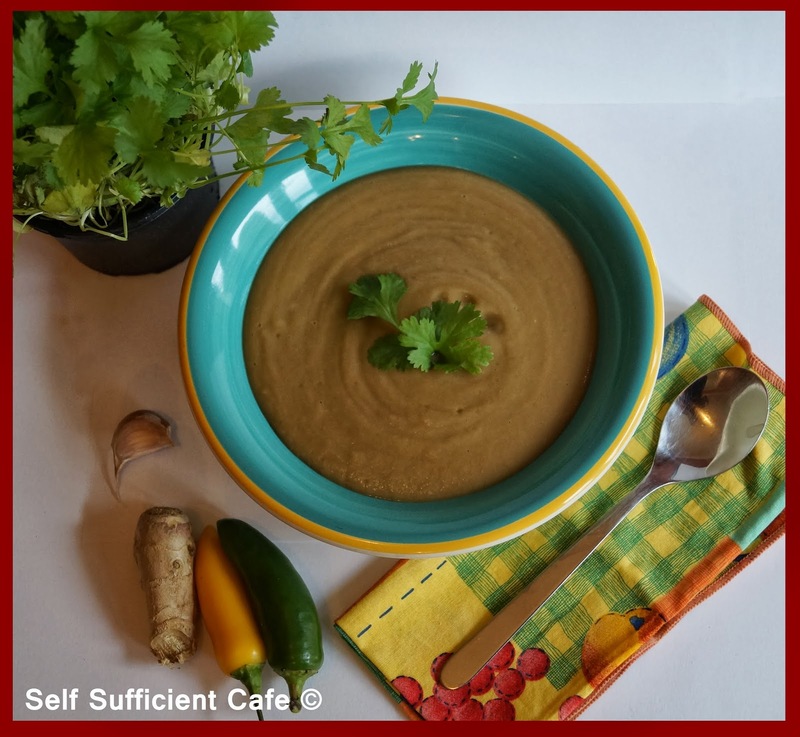 I've shared the recipes for 6 of the 8 dishes form my February menu and here is the 7th, soup of the day; Curried Parsnip. Be warned this soup is fairly spicy but also flavoursome. If you're not too good with heat then either halve the chilli or omit completely. Fry the red onion in the olive oil for 5 minutes, then add the chilli, garlic and ginger and fry for another minute. Add the soy sauce and stir to combine all the ingredients, it will sizzle like mad! Add the parsnips and give everything another stir so the parsnips are coated with the fresh spices. Add the cumin and coriander and give everything yet one more stir. Add the vegetable stock and bring to a boil, turn down the heat and simmer for 8-10 minutes until the parsnips are cooked. I like mine with a bit of bite, not too soft. Transfer to a blender and puree until smooth. Pour back into the cleaned saucepan and re-heat if necessary. Serve with a little fresh coriander on top and enjoy! Are you new to Nutritional yeast? Before transferring to a vegan lifestyle I had never heard of it, but now, I can't be without it, which reminds me I must add it to my shopping list as I'm running low. If you've never tried Nutritional Yeast before, you must give it a go. 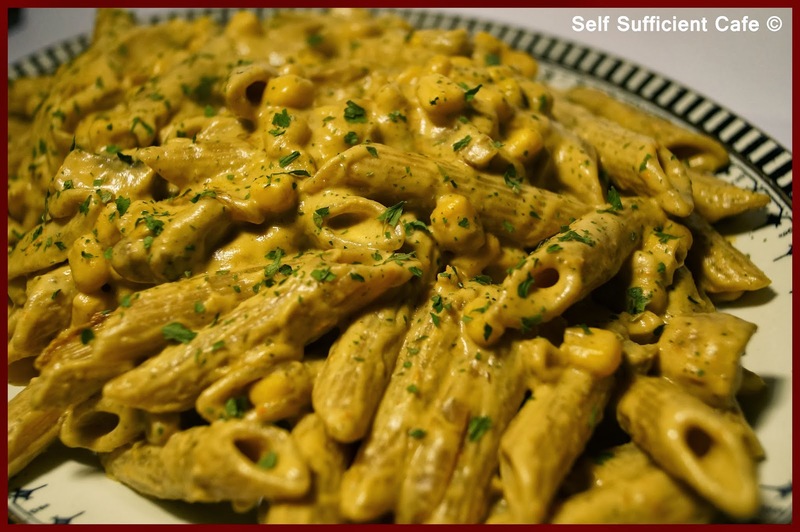 It's lovingly known as "Nooch" and it adds a savoury almost 'cheesey' taste to dishes. I use it in soups, pasta sauces, houmous and pies, it's extremely versatile and can be added to anything. The brand I use is Engevita Marigold Yeast Flakes with Vitamin B12 and most health shops will sell it or order it in for you. Of course there are plenty of online stores too. Today's special is Spinach and Mushroom Pie which has a creamy filling topped with mashed potatoes, perfect for Sunday lunch. 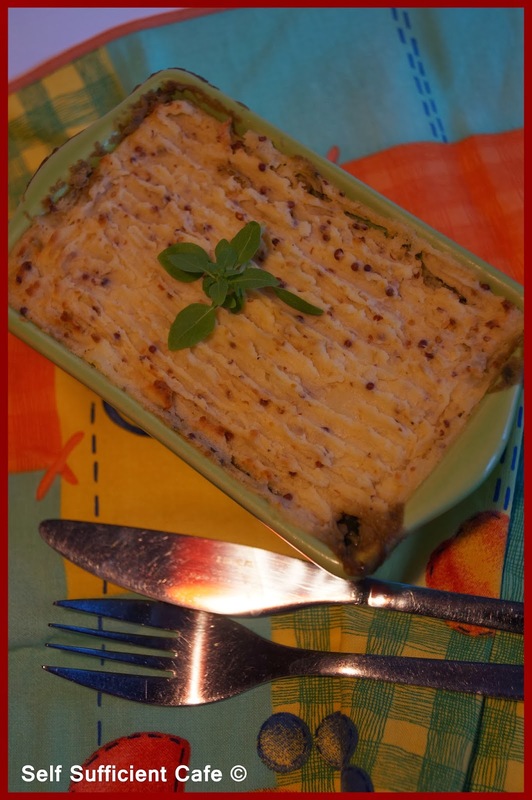 * I already had some left over mash which I used for this recipe, which weighed 300g. You could top your pies with more mash if you prefer. I always make mine with a little Vitalite, salt and pepper and a splash of unsweetened almond milk. Fry the onion in the olive oil for 5 minutes or until translucent, add the garlic and fry for another minute, be careful not to burn it. Add the diced mushrooms to the pan along with the soy sauce and for another 5 minutes, adding a little water if things start to stick. Add the spinach and cook until it has wilted, about 2-3 minutes. 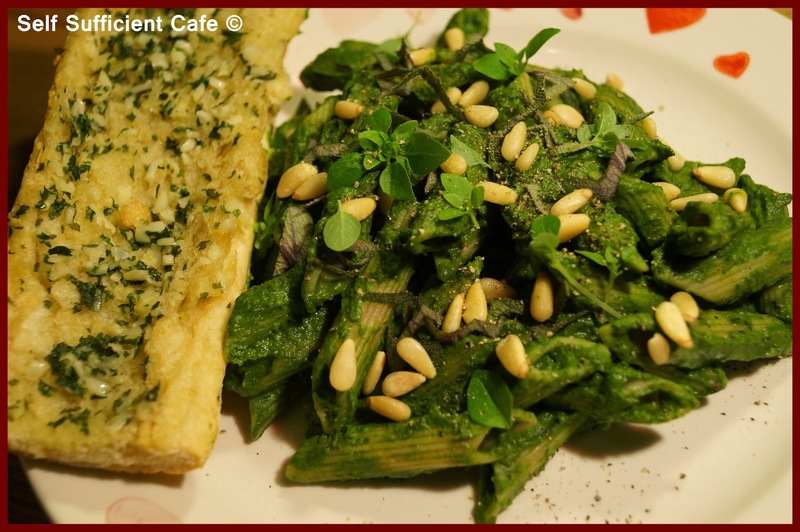 Sprinkle the flour over the spinach and mushroom mixture and stir to combine. Gradually add the almond milk stirring continuously and cook over a low heat until the mixture thickens. Add the nutritional yeast and stir until it has dissolved into the mixture. Transfer to a baking dish or two individual portion dishes. Add the wholegrain mustard to the mashed potatoes and stir through so that the mustard is evenly distributed. 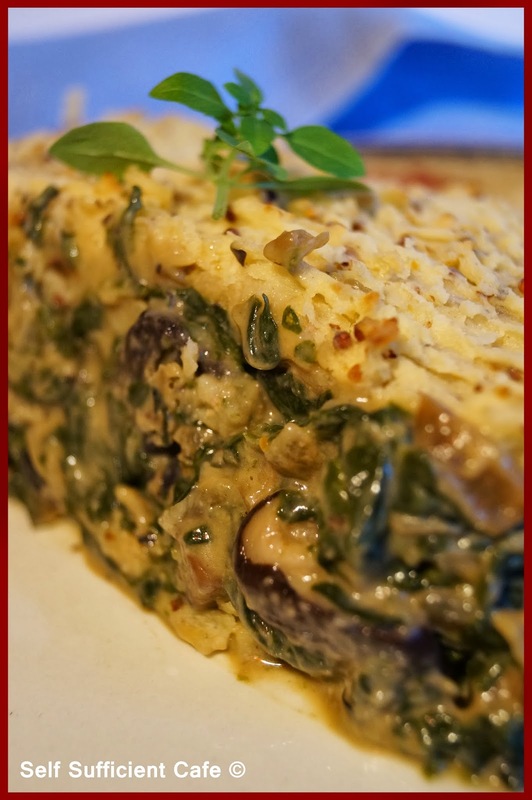 Spoon the mash on top of the spinach and mushroom filling and bake in a moderate oven for 20-30 minutes. 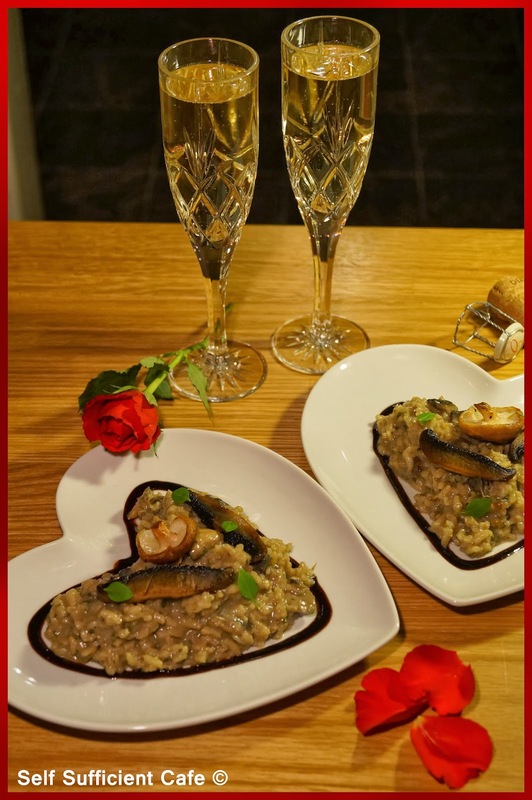 I promised you a menu for Valentines night and here it is, and its a five course meal too! All good healthy food with a little bit of naughtiness for pudding! This is just a pure and simple stack of vegetables with a tasty tomato sauce to finish it off. The best of it is after you've sliced up the vegetables you need, the sauce is made from the remainder. It's a no waste recipe. If you have any left over sauce it can be used with pasta, I'll post the recipe soon. 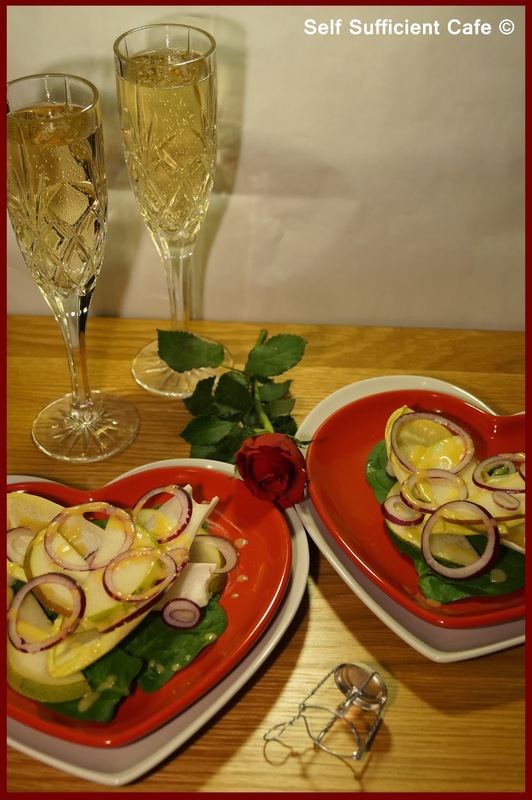 This recipe males 4 vegetable stacks so you could halve the recipe if you want to only serve two (after all it is Valentines!) or you could serve the 2 remaining vegetable stacks with wedges and salad to make it a main meal the next day. First turn on your grill to high, then prepare the vegetables. Thickly cut 4 slices of aubergine and 4 slices of courgette. Quarter the red pepper and de-stalk and peel the mushrooms. 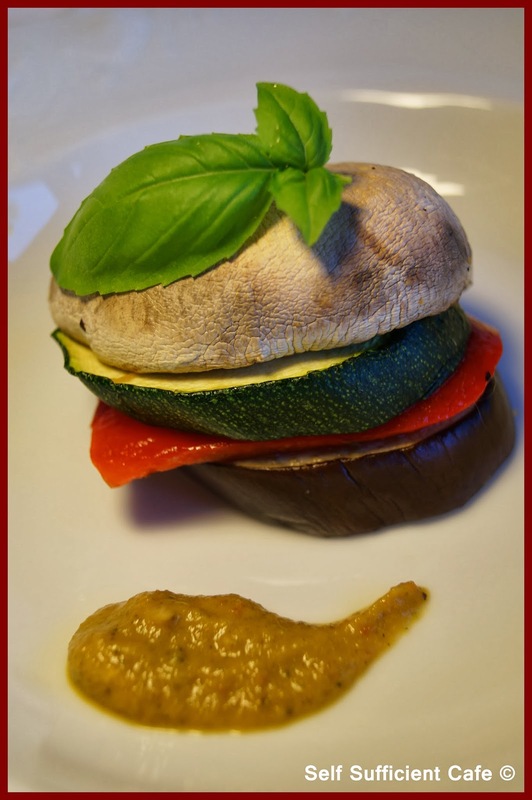 Arrange the slices of aubergine, courgette, red pepper quarters and mushrooms on a grill pan and put under the grill. After 5 minutes (or more if required) turn the vegetables over. 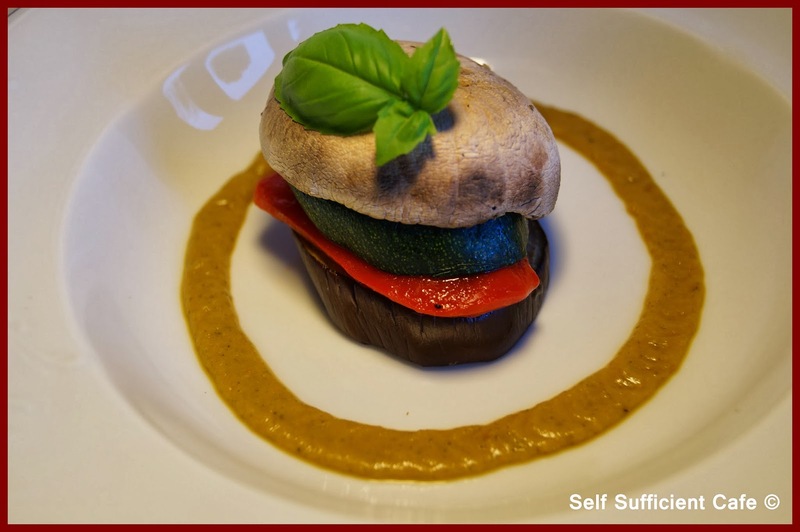 You will probably need to remove the aubergine and courgette slices first while the red pepper skin blackens and the mushrooms cook. Finely dice the remaining courgette and aubergine along with the onion and add to a pan with a little olive oil. Saute for 5 minutes or until the vegetables are soft. Add the cherry tomatoes, garlic and parsley and stir to combine. Add the garlic puree and the tomato puree and stir again. Cook until the tomatoes have reduced and you are left with a thick sauce. Remove the red peppers from the grill and put in a plastic bag and leave for a couple of minutes. This helps with the removal of the skin. Turn the mushrooms over again so that they are able to collect their juices in their middles. Once the mushrooms are cooked pour the collected mushroom juice into the tomato mixture. Pour the tomato mixture into a blender and blend until you have a smooth sauce, add salt and pepper to taste. Serve the stack with the tomato sauce and enjoy. I first made this for my sister when she was suffering with tonsillitis, after researching foods to help heal the illness. 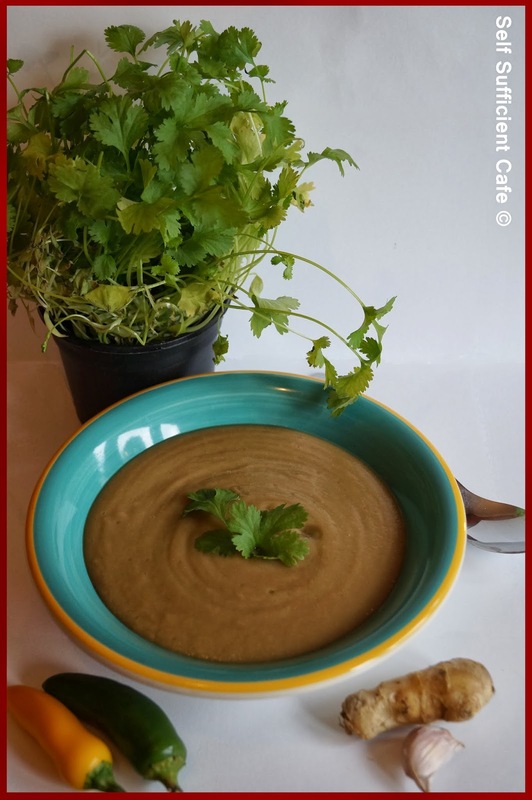 The soup is very creamy but light, so it's perfect for a 5 course meal and you certainly don't need tonsillitis to enjoy it! Saute the onion until translucent, add the garlic and shredded sage leaves and saute for another 2 minutes, turn the heat down a little you don't want to burn the sage or garlic. Add the frozen spinach and continue to cook until the spinach has started to break down a little. Add the vegetable bouillon powder to the hot water and pour over the spinach. Continue to cook until the spinach is completely broken down. Bring to the boil and simmer for 2 minutes. Leave to cool a little before transferring to a blender, add the cashews and almond milk and process until completely smooth. Pour back in to a clean saucepan and reheat before serving. 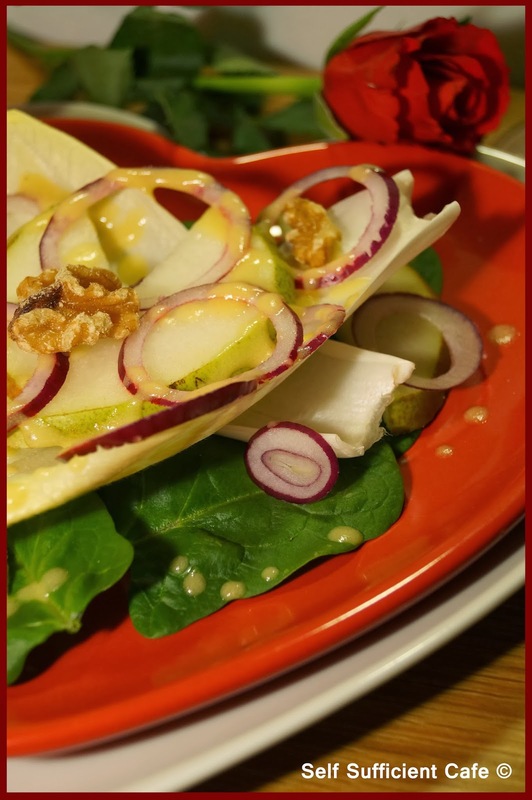 Some people don't like chicory because it is quite bitter, but pair it with sweet pear and a sharp tangy red onion and it's a taste sensation. Well, I think so anyway! 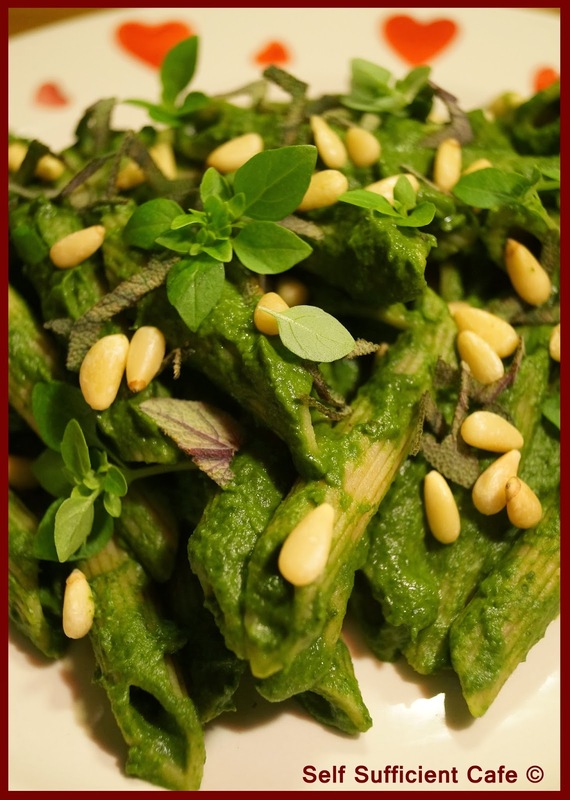 Lay the spinach leaves on a plate and top with a few chicory leaves. Slice the red onion thinly and arrange on top of the chicory. 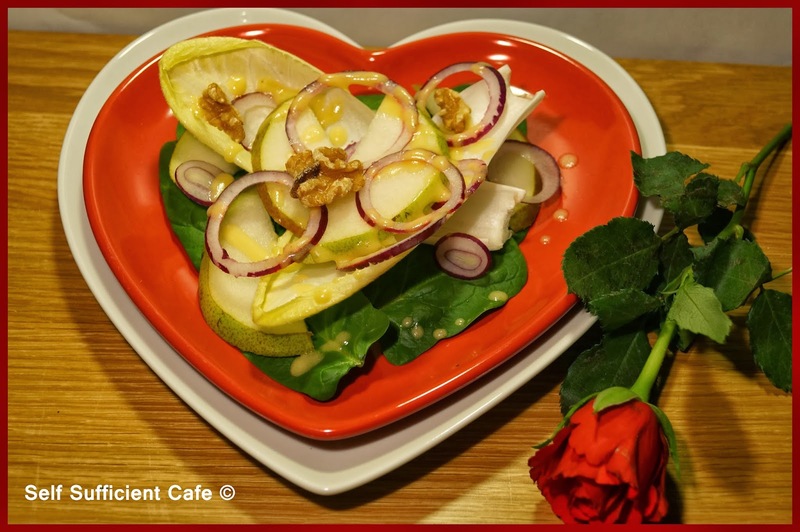 Slice the pear length ways and halve and arrange the pear halves on the plate. Next scatter the walnut halves on the top. To make the dressing, put all ingredients in a screw top jar or bottle and shake well. Pour the dressing over the salad and serve at once. 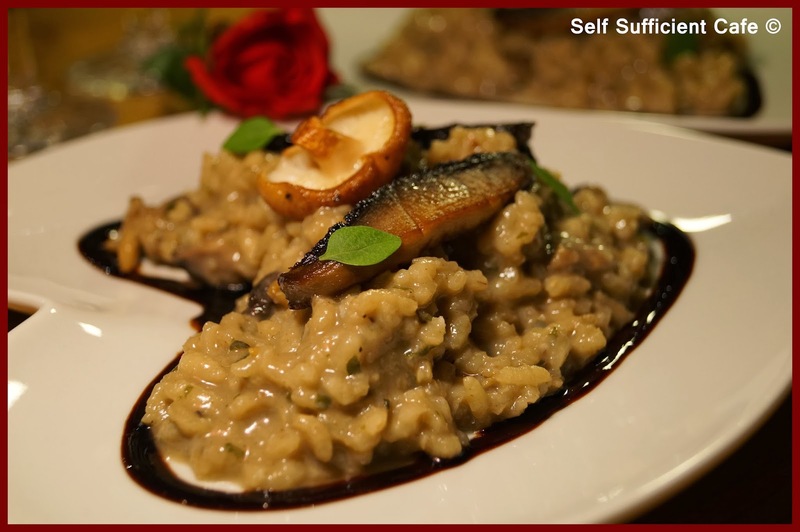 I don't know about you but I love risotto, especially mushroom risotto. It's the perfect Valentine meal, with all that love, care and attention it is given while you make it. Fry the wild mushrooms in 1 Tbsp of Vitalite and the Olive oil for 3 minutes, then remove with a slotted spoon and reserve. Add a splash more of olive oil if needed and saute the onion until translucent, add the crushed garlic and saute for another minute. Add the chopped mushrooms and cook for another 4 minutes before adding the mushroom ketchup. Stir and add the white wine, cook for another minute. Add the rice and stir so that it is coated with the liquid in the pan and cook until the rice has soaked up most of the liquid. Add the porcini powder and stir to combine. Add a little stock and stir, once the rice has soaked up the stock add a bit more at a time until you have used half of the stock. Add the parsley. Continue adding a little stock at a time until all the stock has been used and your rice is cooked. Add the nutritional yeast and stir through the rice. Add the remaining Vitalite and beat into the rice, this will give the risotto a shine. 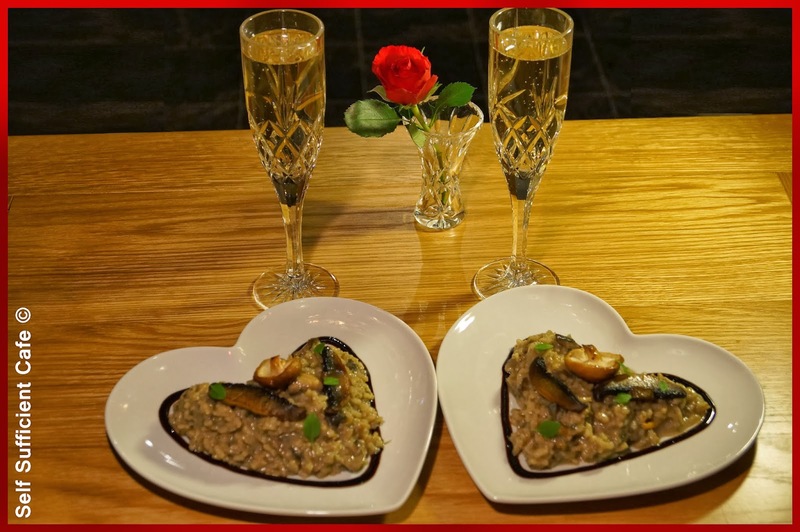 Serve the risotto with the reserved mushrooms as a garnish. Any left overs can be heated up the next day although you will need to add some more stock or water. Chocolate mousse made out of avocados isn't new, its all over the internet. I have tried a few recipes but they have just not been to my liking. So, I started from scratch and wrote everything down that I added and I kept adding until I was happy. Once I got the consistency and taste to my liking, I made it again making sure that I hadn't missed writing anything down. The secret to a good vegan chocolate avocado mousse in my opinion is..........sweet freedom choc shot! Add all ingredients except from the strawberry to a blender and process until smooth. You will need to stop the machine a couple of times and scrape the mixture down from the sides. Be sure that everything has been pureed you don't want any surprise avocado pieces in the chocolate mousse! Slice the strawberry and tweak the top of each slice to make it resemble a heart. 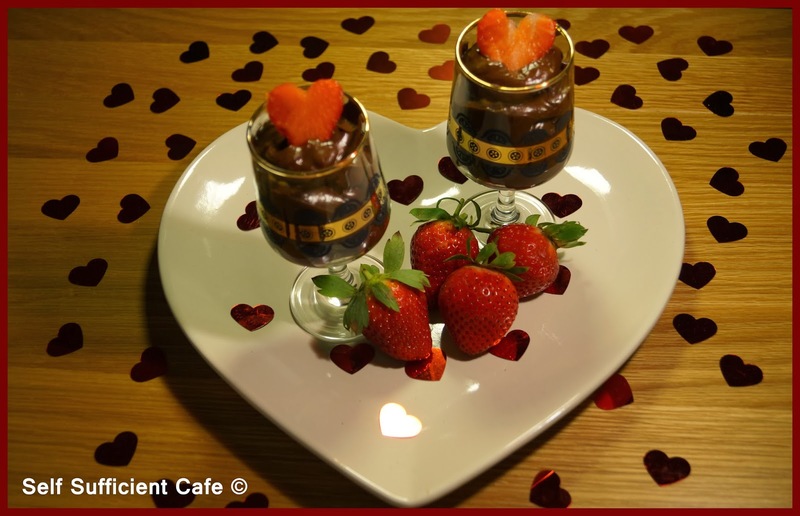 Spoon the mousse into serving glasses and top with a strawberry heart. 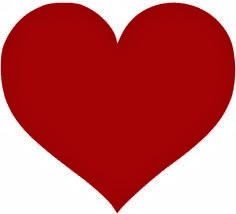 Happy Valentines Day for tomorrow! This is the first recipe that I'm sharing from the 'daily/weekly' specials menu, more to follow throughout the month. When it comes to pasta I either make a tomato based sauce, sometimes with other vegetables such as aubergine and courgette or a 'cheese' type sauce. Tonight I wanted something different, something vibrant, something green. 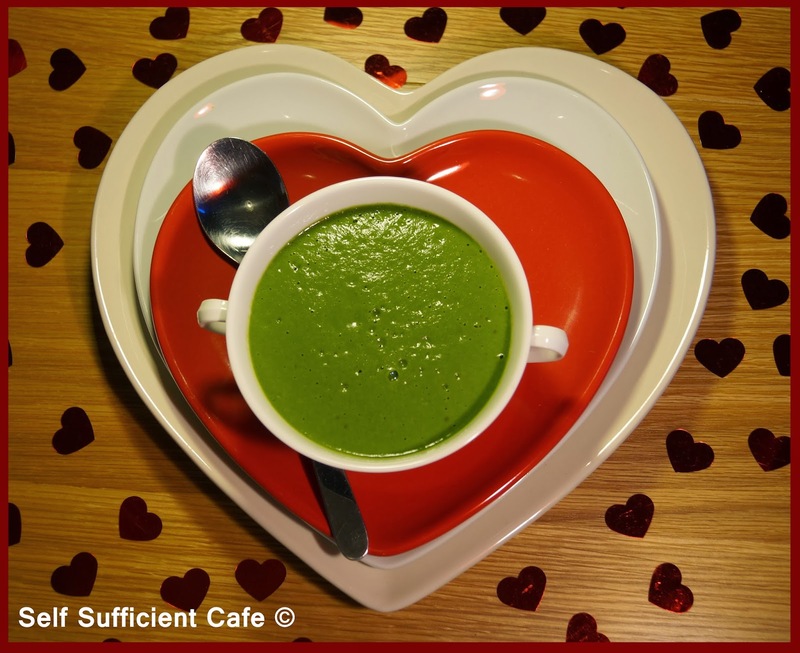 After making my soup course for my Valentines menu I had some spinach left over, (ooh another little hint at whats in store). I used frozen spinach for my soup recipe and as I haven't got my freezer sorted (yet) it needed using up. So I set to and made a spinach sauce. I was really pleased with the outcome and I've tried it with two types of pasta, Penne and Spaghetti, both were good, although in my opinion you can be a little more creative with how you serve spaghetti. First, defrost the spinach, I used a microwave to speed up the process. Drain the spinach through a sieve pressing down to remove most of the water. Transfer to a blender. Roughly chop up the garlic clove and add to the blender with the spinach. Add the vegan 'cream cheese', almond milk, nutritional yeast and a (very) generous grind of black pepper. Process until you have a thick sauce, if your blender is not that powerful you made need to add a little more milk. Transfer to a saucepan and warm through, be careful not to boil. Add the spaghetti to a pan of boiling water and cook as per packet instructions, you won't need much longer than 8-10 minutes. Drain the spaghetti, reserving a little of the cooking water in a jug and tip the spaghetti into the pan. Tip the sauce over the pasta with a little of the reserved cooking water and stir through. 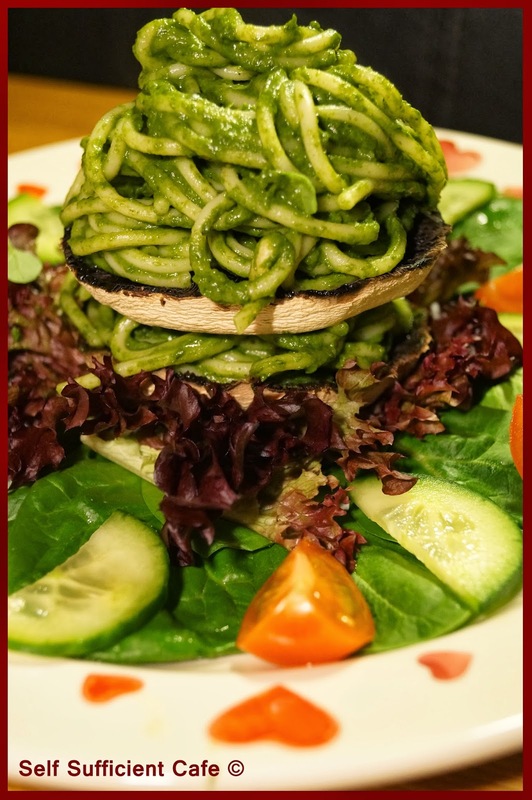 Serve at once, I served mine a top two grilled field mushrooms which sat on a spinach and mixed leaf salad with cherry tomatoes and cucumber. The mushrooms paired beautifully with the spinach. Or serve with a hunk of homemade garlic bread. It's so easy to make, finely chop 3 cloves of garlic on a chopping board with a little salt, this helps to make the garlic more into a paste. Add a good glug of extra virgin olive oil and mix on the board. Slice length ways a hunk of bread and mop up the garlic, salt and olive oil with the cut sides. Wrap the bread cut sides together in silver foil and bake in an oven for 10 minutes. Caution: It's extremely garlicky, just the way I like it! Yesterday was the grand opening of the virtual Self Sufficient Cafe and I explained that at the start of each month I will share the months menu. Every week of each month I will post a recipe from the menu. That way you get at least 4 or 5 new recipes a month plus any daily specials as the menu board to the left details. To start things rolling the first recipe I'm sharing is stuffed nutty peppers, it's that easy I shouldn't really call it a recipe. 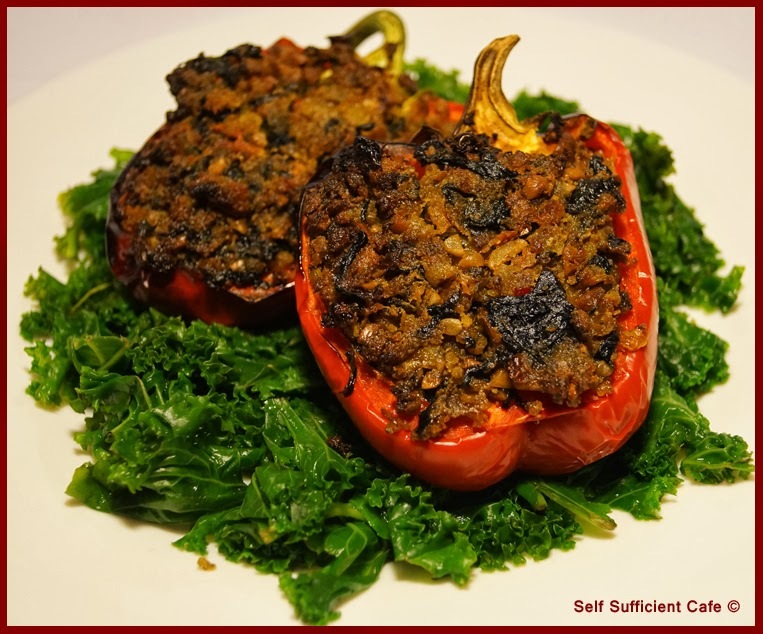 You only need 6 ingredients, one of which is the pepper which holds the 'stuffing' and another is the curly kale which serves as a bed for the pepper to rest upon. This leaves only four other ingredients which act as the 'stuffing', how is this possible? Easy! We cheat! All you need is two Goodlife nut cutlets! Fry the onion is a little olive oil until translucent. Add a little water if the onions start to stick. Wash the spinach and shake to loose excess water and roughly chop. Add to the pan with the onions and cook until wilted. You may need to keep adding a little water now and again to stop the spinach sticking to the bottom of the pan. Dice the cooked nut cutlets and add to the pan and stir. Add the Tofutti cheese, stirring it through the mixture as it melts. Halve the red pepper through the stalk, purely for aesthetic reasons and de-seed. Spoon the 'stuffing' into each half and bake in a moderate oven for 20-30 minutes or until the pepper is soft. While the pepper is baking, steam or boil the kale, drain and squeeze out a little water. 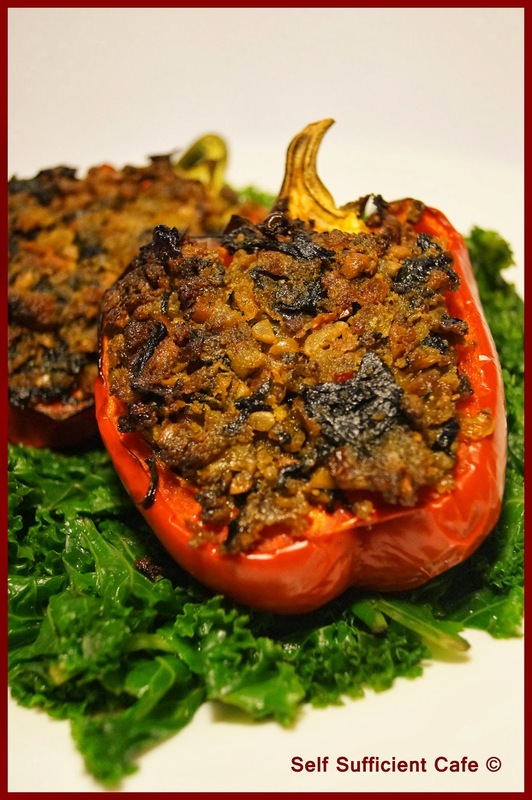 Spoon the kale onto a plate/plates and top with the red pepper halves. As my regular readers already know I’m passionate about food, growing and eating it! I had been a vegetarian for 27 years and at the very start of 2013 I transferred to a vegan lifestyle. I now feel healthier and I have more energy, so my first veganniversary was definitely one to celebrate. One of my passions is to open my own vegan bistro to show people how tasty vegan food really is. So many times I hear people saying “eww, vegan – no thanks” they really don’t know what they are missing out on. Not only is vegan food tasty it is far healthier for you too. 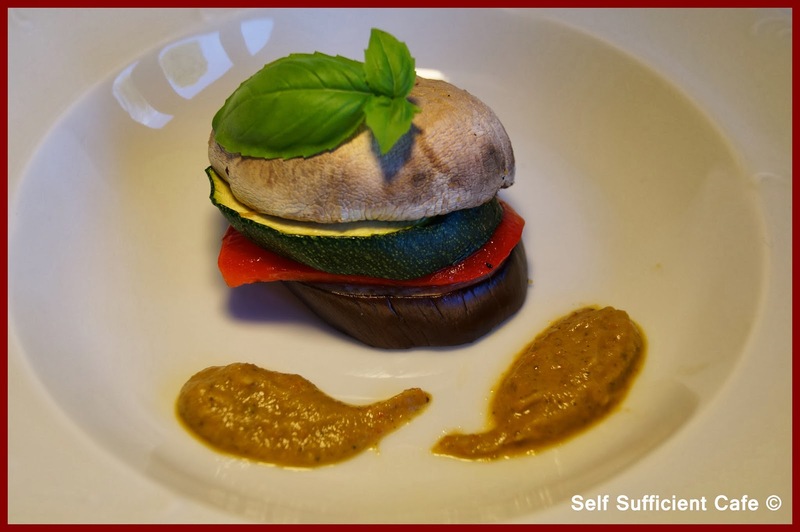 Until such time I can open my very own vegan bistro I decided to showcase my recipes on my blog. My food knowledge has grown enormously since transferring to a vegan lifestyle, and I regularly use ingredients that I never knew existed, like nutritional yeast, miso and weird looking or sounding fruit and vegetables. The world really is your vegan friendly oyster, full of exotic foods just waiting for you to try. 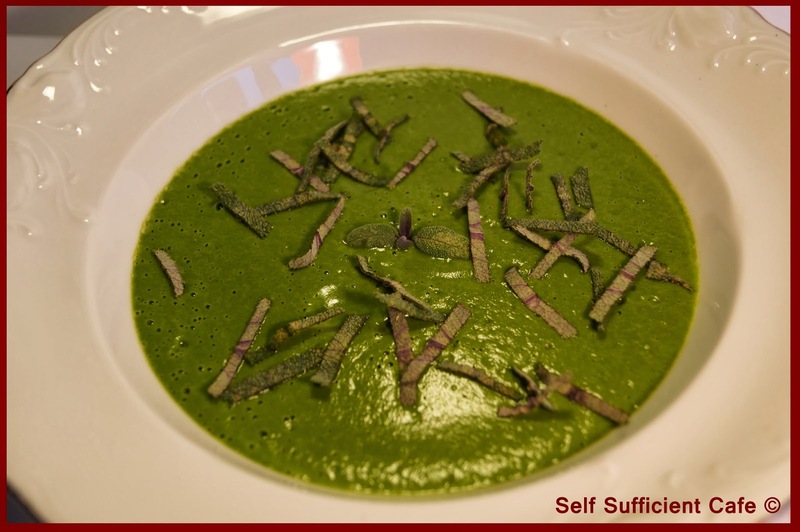 Another passion I have is to become self-sufficient, hence the name of my blog, but becoming totally self-sufficient isn’t easy to do and from what I can gather it requires money and lots of it. However, one thing I can do is grow my own fruit and vegetables and trade with family and friends who have bigger gardens or allotments. Any fruit or vegetable is greatly received and in honour of such wonderful food I create recipes with love and thanks. And so to it, the grand opening of Self Sufficient Cafe, well in the virtual world anyway. At the start of every month I will post the menu for the month ahead and share with you 1 recipe from the menu each week. 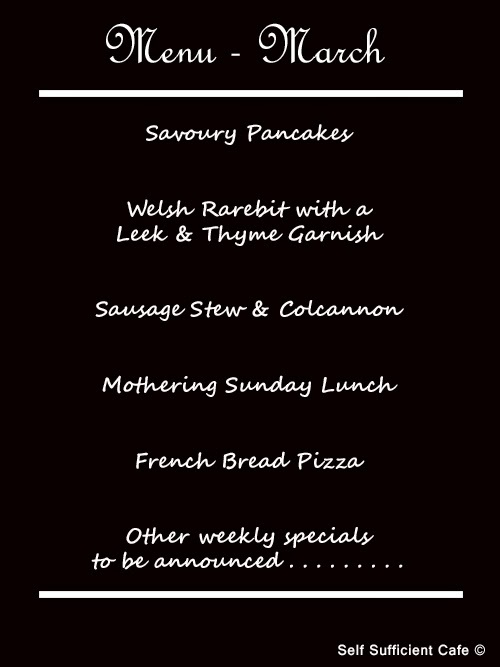 As the menu suggests I will also share with you other weekly specials. 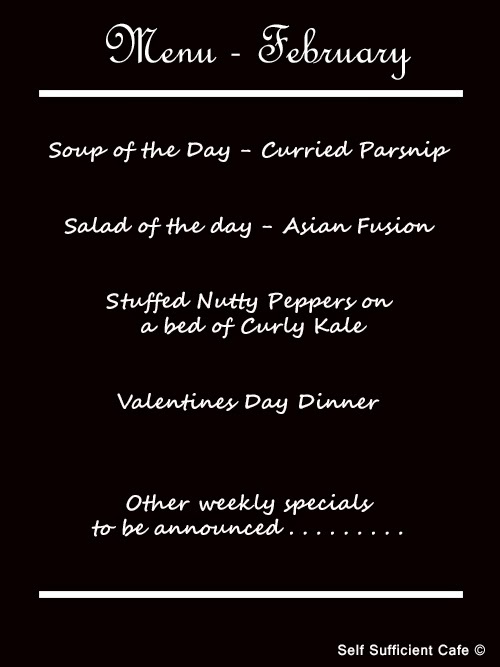 So without further ado - here is the menu for February. You can't get away from it, everywhere I look I'm reminded of the fact that its Superbowl Sunday. Apparently the Seattle Seahawks are playing the Denver Broncos. So, how does the saying go, if you can't beat them, join them. This morning I made some BBQ sauce and pressed some tofu, then marinated it in the BBQ sauce for most of the day. 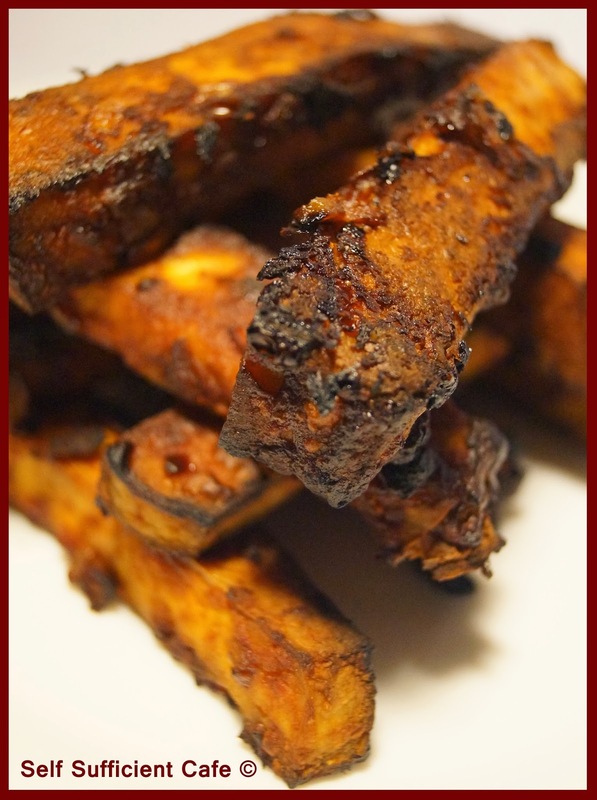 I served the BBQ tofu strips with spicy wedges and a stuffed mushroom. Whilst we weren't able to watch the game while we ate dinner, we sure enjoyed the food! Saute the onion, garlic and chilli in the olive oil until the onions are translucent, turn the heat down you don't want to burn the garlic. Add the bourbon, it will sizzle like mad! Stir, then add the water and stir again. Add the soy sauce, tomato ketchup, maple syrup and cider vinegar and bring to the boil, stirring all the time. Reduce the heat so the mixture is simmering and add the mustard powder and smoked paprika. Continue to simmer for another 5 minutes until the mixture thickens. Pour half the sauce into a bowl and add the tofu strips. Add the remaining sauce and gently turn the tofu so that it is covered in the sauce. Let sit for at least 2 hours or longer if you have the time. 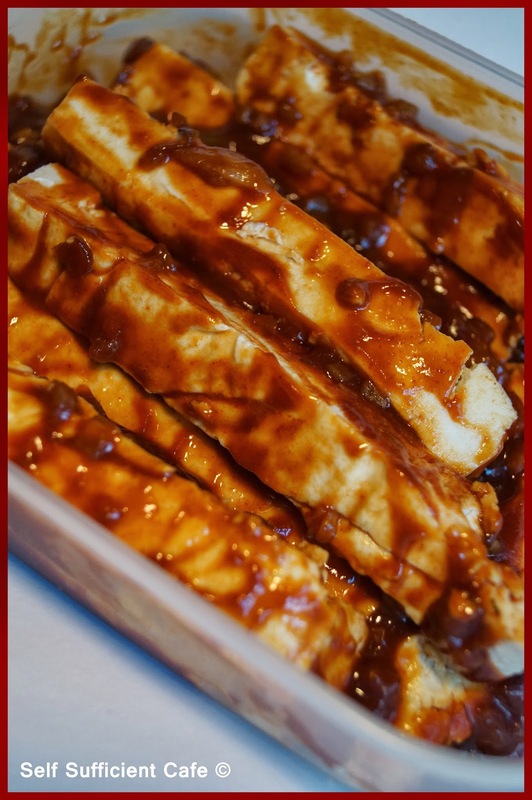 Turn the tofu strips onto a greased baking tray and bake in a medium oven for 40-45 minutes. I served mine with spicy wedges and a quick & easy stuffed mushroom, recipe coming soon. Perfect Sunday Superbowl food! 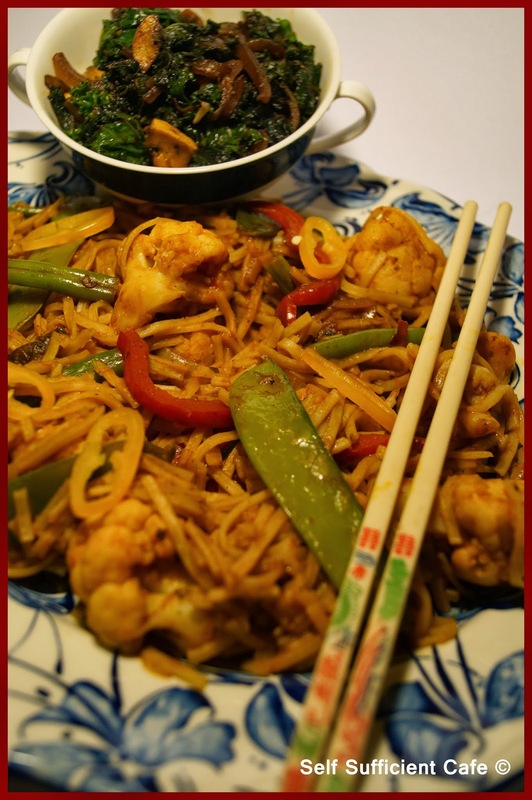 OK, so I'm officially 1 day too late, as Chinese New Year was 31st January but as today is Saturday it gave me more time to create a recipe and try it out before posting. Well, that's my excuse and I'm sticking to it! I was planning on making a banquet, but time got the better of me and I only made 2 dishes; Schezwan noodles with vegetables and a spicy kale and mushroom stirfry. 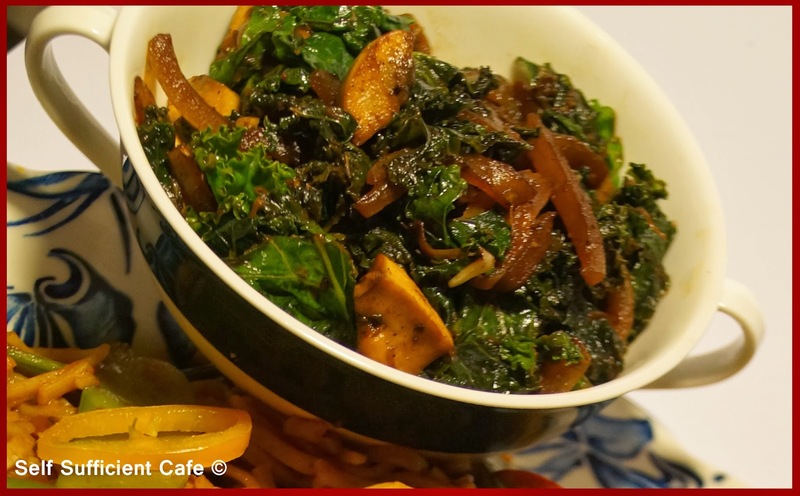 I was really happy with the kale and mushroom dish, try it and see what you think. Gently fry the onion in the sesame oil until translucent. Next add the garlic, ginger and chilli and fry for another minute. Add the kale and continue to move around the wok until it starts to wilt. Add the Chinese 5 spice powder and a little water if it starts to stick, adding more water as necessary. Add the soy sauce and mushrooms and stir fry for another 4-5 minutes, adding further water if necessary. Add salt and pepper to taste and serve at once.